During my first term as a DMA student, I can’t even count how many people have looked at me with looks of disbelief and said “YOU’RE starting your DOCTORATE? !” Yes, I know I look young (which will hopefully be to my advantage once I turn 40). But, as someone who has quite a few students with parents much older than me, it went deeper than that; it was easy to feel like I didn’t deserve to be where I was or shouldn’t be teaching or performing in a professional orchestra, simply because I wasn’t old enough and didn’t have the experience. I know I am not the only one who struggles with this. Nothing can substitute for experience, and I am the first to admit that I have lots of things to learn, but I think it’s important to share with everyone going through this same thing that: you deserve to be where you are, you know what you’re talking about, and everyone (your students, parents, colleagues, even teachers) has something valuable to learn from you. Unless it directly applies to the instrument, leave it out (I honestly believe that this goes for any kind of interaction that you have with anyone, ever. How are those comments about people’s weight/size ever appropriate unless you're at the hospital? Maybe it’s just me.) This makes the person feel that they are being attacked personally, and even more self-conscious than they already are in the lesson/rehearsal/performance situation. There are things that we, as young professionals in music or really any industry, can do to aid the situation. First, dress professionally (“dress for the job you want, not the job you have”). Also, keep a calm and professional manner in interactions with others in person, over email, or in phone conversations, even when you are not being treated with the same courtesy (in other words, be the bigger person). And, no matter what, have the confidence in each lesson and coaching that you teach that you deserve to be there, you have a lot to offer, and that they are lucky to work with you. Generally, if the people that you’re working with feel this confidence coming from you, they will quickly become to trust you. This is of course a natural process of trust that can apply to any teacher/student/colleague situation, but I feel that it is more complicated when there is already suspicion about one’s qualifications due to their age and/or background. Stay strong, and keep your conviction. THIS IS AN OUTSTANDING TOPIC PUT "OVER THE COUNTER". AS A LATE STARTER AMATEUR ON VIOLIN (AT 26), I HAD LITTLE PROBLEMS WITH MY INITIAL PROFESSORS DOWN HERE IN MEXICO CITY, BEING MOST OF THEM OF MY SAME GENERATION AND CULTURAL BACKGROUND. TWO DECADES AFTERWARDS, I AM ASSISTED PRIVATELY WITH TEACHERS MUCH YOUGER THAN ME AND I LIKE THAT, SINCE THEY ADD INGREDIENTS OF FUN, FRESHNESS AND YOUTH'S PASSION. WHAT I DO RESPECT, AND I DO MEAN IT, HAVE TO DO WITH PROFESSIONAL HABITS RATHER MORE THAN MUSICAL CAPACITIES AND ACADEMIC PEDIGREE (SINCE MOST OF THEM HAVE MORE THAN ENOUGH TO TEACH ME) RATHER THAN AGE. THUS, PUNCTUALITY, GENUINE INTEREST, PATIENCE AND "YOU CAN GET IT-PSICOLOGY" ARE PARAMOUNT ON THE SELECTION AND CONTINUITY OF MY LEARNING INTERACTIONS WITH YOUNG TEACHERS. A COMMON LIMITATION I COME ACROSS WITH YOUNG PROFESSORS IS "POP -REPERTOIRE" (MY MAIN INTEREST!). IT IS A BIT FRUSTRAITING THE GENERATION GAP IN TERMS OF SHARING THE SAME PASSION ON MUSIC THAT YOUNG GENERATIONS DO NOT CARE ABOUT. FOR INSTANCE, I AM PLAYING THE FULL SUITE OF "GODFATHER" SOUNDTRACK AND THEY DO NOT KNOW EITHER THE FILM NOR THE MUSIC. THE SAME GOES FOR MELODIES OF CHARLES AZNAVOUR, CARLOS GARDEL, ENGELBERT HUMPERDINCK AND CAROL KING TO NAME A FEW. IN CONSEQUENCE I TAKE THE TECHNICAL KNOWLEDGE THEY OFFER ME WITH GREAT APPRECIATION, BUT WE CANNOT MERGE IN ONE SINGLE SOUL WHEN APPLYING IT TO MUSIC OF MY LIKE. I RECKON, SEITZ, ACCOLAY AND KREUTZER ARE KEY IN VIOLINST'S EDUCATION, HOWEVER, OFTEN I LIKE TO GO LIGHTER TOO AND THERE'S WHERE THE I FEEL "COACH-LESS". ANYHOW, I LIKE GROWWING UP IN MUSIC EVERYDAY WITH THE ENERGY OF THE YOUNGSTERS AND I DO VALUE THE DIVERSITY OF PROFESSORS WE CAN RESORT TO NOWADAYS. ONE LAST THING, I HAVE NOTICED THAT THOSE YOUNG VIOLINIST THAT ALSO ENGAGE ON TEACHING, THEY ADVANCE FASTER AND MORE SOLIDLY THAN THOSE THAT ONLY PRACTICE AND PRACTICE AND PRACTICE (ON THEIR OWN). 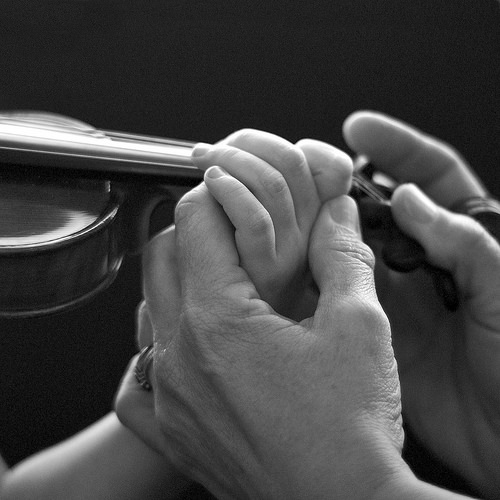 MY CONCLUSION IS THAT RAPPORT WITH THE TEACHER CAN BE FORGED REGARDLESS THE AGE, AND THAT IS IMPORTANT WHEN LEARNING VIOLIN AS A COMMITTED HOBBY. November 25, 2018 at 12:25 AM · Lovely. November 25, 2018 at 12:48 AM · Thanks for writing this! Well said. I personally believe in deference when dealing with an expert (makes it easier to learn from their expertise), but sometimes older musicians can take advantage of the power that gives them. Important to know where the line is. November 25, 2018 at 02:49 AM · Editorial note: please don’t anyone ever write a comment in all capital letters; it is the equivalent of screaming! November 25, 2018 at 05:22 AM · I think this applies in amateur ensembles as well. I've played in a casual community orchestra where I was condescended to by a whole bunch of people who couldn't believe anyone under 60 could possibly understand classical music or have played in an orchestra before (probably 80% of the orchestra was retirees), and as principal violist had a 89-year-old in my section who balked at taking bowings from a section leader without gray hair. I also got highly dubious unsolicited advice, e.g. the above-mentioned elderly violist told me on two occasions that I should tighten my bow until the stick was straight. I remember feeling especially insulted the first time I got that bit of bad advice, because I had performed Bartok's Concerto for Orchestra exactly three days earlier with my other orchestra and was now being condescended to in an ensemble nowhere near that level. But since it was my first time leading a section, I have to admit I internalized some of the doubts about my qualifications anyway. Mostly I tried to keep a professional demeanor, at least fake confidence even if I didn't really feel confident, and let my playing do all the talking. It took more than a year to win over the doubters, but the experience probably made me a much better section leader. I encountered a similar dynamic in a previous non-auditioned community orchestra, though to a much lesser extent because I wasn't principal violist and thus wasn't a lightning rod for that kind of thing. I actually found both of these experiences ironic because I'd experienced ageism from the opposite direction when I was starting on strings, being rejected by multiple teachers who said I was too old to ever get beyond beginner level on a string instrument. I for one am never going to make assumptions about someone's ability because of age, whether old or young. November 25, 2018 at 06:00 PM · Young-looking professionals who want to assert more authority can do so through their demeanor, language, and attire. John T. Molloy, in his 1975 classic "Dress for Success" suggested that young-looking or smaller people should pay extra attention to precise tailoring and high-quality fabrics. I think that's still good advice. Women can additionally accessorize with expensive-looking jewelry or handbags, whereas Molloy recommended that men wear only their wedding bands (if married) and a watch. Start every email with "Dear" so-and-so, not "Hi" and finish with "Sincerely" or "Best Regards" followed by your full name and appropriate signature data. Luddite: "You're starting your doctorate?" Clara: "It'll get easier once I'm old enough to drive." Luddite: "You're so skinny and tiny." Clara: "Makes it easier to pack a suitcase." November 25, 2018 at 07:52 PM · I remember those days. One of the things I did from the start as a very young-looking 24-year-old in my first job was have my new private students (some only seven or eight years younger than me) call me Ms. Lastname instead of by my given names. It helped that I was in the deep South where this was culturally expected anyway. November 25, 2018 at 09:05 PM · I have a friend at my teaching school who was told by our boss to "dress more formally" because she's shorter. The students' parents weren't taking her seriously. It actually worked! 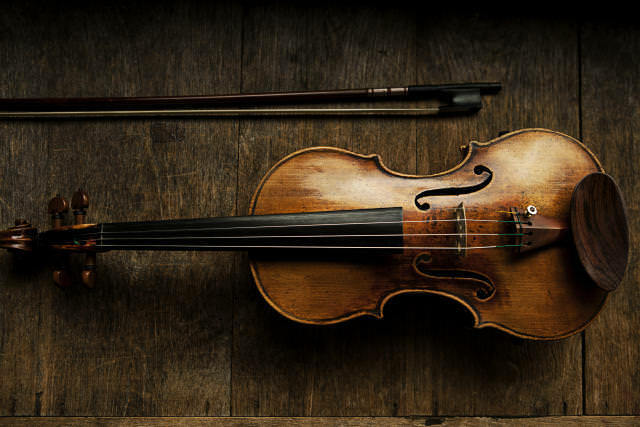 November 26, 2018 at 11:34 AM · I started to learn violin a little late, at 51. All of my teachers were under half my age and it never looked like they didn't have the skill or experience to teach. But I can see that may be a problem sometimes, it is a cultural issue. November 27, 2018 at 03:07 PM · It seems to me that any comment about a teacher, colleague, or student's size and apparent age is just plain rude and out-of-bounds. Can you imagine the opposite of what Ms. Fuhrman reported? As in: "You're so fat, and I can't believe you look so old!" November 30, 2018 at 07:21 PM · Well, funny fact. Nobody have a single concern about my knowledge, or experience, because I'm 40. That's silly! They all assume that, as I'm old enough, I'm good enough. But, to tell the truth, I don't even have half of the experience that my 24 years old teacher have!